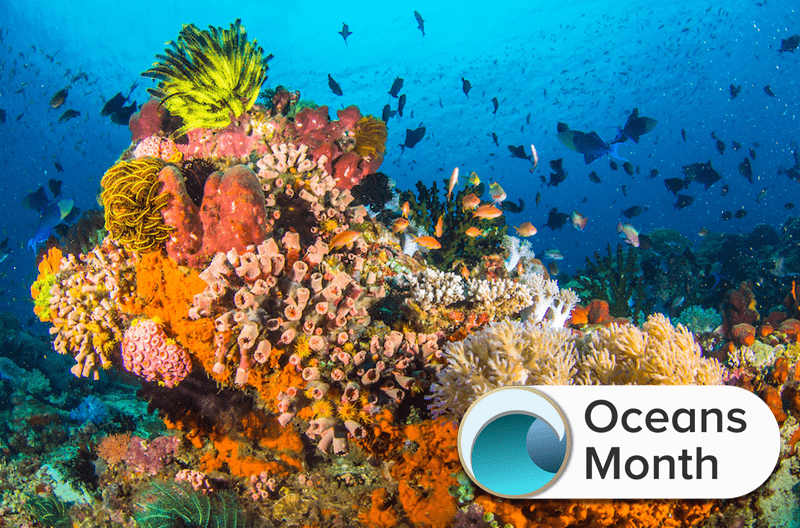 This is a part of Oceans Month, where we explore the science throughout the world’s oceans and meet the people who study them. Want to dive in with us? Find all of our stories here. Worldwide, corals are suffering from bleaching events due to rising ocean temperatures and human activity. The Great Barrier Reef has had bleaching events in 2016 and 2017, and the Pacific and western Atlantic ocean is currently experiencing a bleaching event that began in 2014. But in these tropical areas, there are pockets of coral that are surviving these events while neighboring coral die out. A study published in the Journal of Applied Ecology described that “coral oases” provide a “glimmer of hope,” according to marine biologist Ilsa Kuffner. She talks about how these corals might be surviving and how it could be used for conservation. Ilsa Kuffner is a Research Marine Biologist with the U.S. Geological Survey at the St. Petersburg Coastal & Marine Science Center in St. Petersburg, Florida. –because every story has a flip side. Now you know that coral reefs worldwide are dying due to climate change and human activity. The Great Barrier Reef has seen bleaching events two years in a row. The Pacific and Western Atlantic oceans have been suffering from a bleaching event that started in 2014. But listen. There might be a glimmer of hope, because researchers documented what they’re calling “coral oases” in some tropical areas. Their results were published in a recent study in the Journal of Applied Ecology. Ilsa Kuffner is an author on that study, and a marine biologist with the US Geological Survey based out in St. Petersburg, Florida. Welcome to Science Friday. ILSA KUFFNER: Hi, thanks for having me. IRA FLATOW: So we’re talking about bad losses in the Pacific and Atlantic. ILSA KUFFNER: Yes. It’s estimated around 50% of the world’s coral reefs are now considered degraded, which means they’ve lost a lot of the hard corals that produce the reef’s habitat that other inhabitants of the reef and humans depend upon. And– sorry. Go ahead. IRA FLATOW: But I’m saying that you have some hopeful news for us, though. ILSA KUFFNER: Yes. So there were 18 of us on the Powell Center working group, coral scientists from around the world. And over the years we had observed in our studies, as would people who had general experience on reefs, that there always seems to be pockets of reefs that are doing better than others. And we all have our favorite spots. So for this study we wanted to see if these anecdotal observations held up in the existing long-term data sets that exist out there, meaning sites that have been visited by scientists for at least 10 years. And we found that yes, there does seem to be sites that persist over time, doing better than expected than their neighbors. And we categorized these oases into three different types. We categorized resist oases, meaning oases that experience stress, but the corals didn’t succumb come there. And then we had escape oases, like the community existed in a place where the stress was less severe for some reason. And then the third category, which, unfortunately, only a few reefs fit into, were the rebound reefs, where the community was killed off, but then was able to recover. IRA FLATOW: So what’s the future? Can we learn from these reefs to make the coral healthy again? ILSA KUFFNER: Yes. So I mean I think there’s some very hopeful news here. I think oases exist because the ocean is a very dynamic and complex system, especially near shore, where shallow corals live. And these are patchwork mosaics of micro habitats, where everything has a ton of natural variability, even over short distances, in things like water chemistry, temperature, and even in the corals themselves. A slide I like to show during the talks I give is a photograph I took on a reef during a bleaching event showing two corals growing side by side. They’re the same exact species experiencing the same exact environment. But one is completely bleached white, and one appears completely unfazed. So what this means is, despite the diebacks we’ve been seeing, there’s still a considerable amount of genetic variability out there for natural selection to act upon. And this is a great source of hope, yeah. IRA FLATOW: Before you go, I have to ask you one question. The LA Times is reporting that a new director from the Trump administration instructs federal scientists like yourself with the US Geological Survey to get approval before agreeing to most interview requests from we reporters. Did you have to get permission to do this interview? ILSA KUFFNER: No, I wouldn’t say I had to get permission. I just notified my supervisor and my chain of command. But they were supportive of it. IRA FLATOW: That’s good. It’s good to hear. And we will be following your research. Thank you very much for taking time to be with us today. Good luck to you. ILSA KUFFNER: Well, thank you very much. Yes, thank you. IRA FLATOW: And Ilsa Kuffner is a marine biologist with the US Geological Survey based out of St. Petersburg, Florida.